With each Eagle Harbor story I read, I fall a little more in love with this remote coastal town. 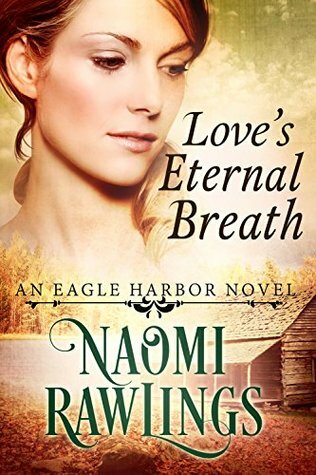 Another wonderful addition to the series, Love’s Eternal Breath is possibly my favorite yet! Naomi Rawlings paints beautiful pictures with her words and transports readers to the rugged shoreline of Lake Superior. Seth Harrington and Lindy Marsden are complex characters brought together through unexpected circumstances. There is hurt and heartache in their journey, yet love and hope abound. 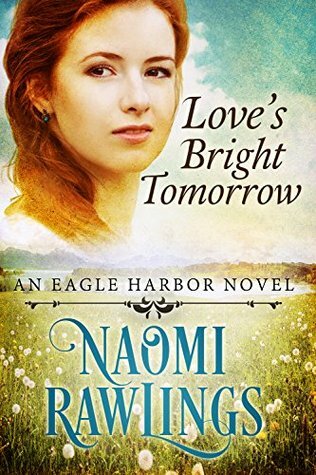 I loved this touching and tender tale and eagerly await my next visit to Eagle Harbor! Lindy Marsden once dreamed of having a husband, a house, some children, and maybe even a sewing machine. But since she grew ill five years ago, those dreams have become too much to hope for. Now she just wants to provide for herself and help the abandoned children she found living in the woods until their father returns… and avoid doctors for the rest of her life. Their medicine never leads to any good, and she has the scars to prove it. When the plight of a young abandoned boy brings Seth and Lindy irrevocably together, Seth finds himself in the most difficult situation of his career. His expertise can help him heal the sick, but will his love be enough to soothe Lindy’s wounded soul? No matter how hard she tries to help, Rebekah Cummings always ends up causing more problems than she solves. This time, though, things will be different. 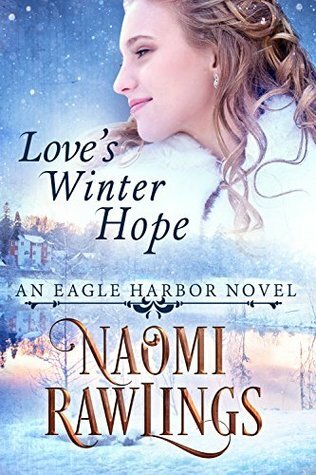 She’ll find a way to pay her family’s debts, even if doing so requires leaving Eagle Harbor. Maybe then they’ll start treating her as a capable woman who makes her own choices. 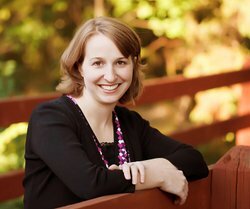 Rebekah well remembers the pain she endured the last time she tried trusting Gilbert, and Gilbert can’t afford to pursue the love of a working class woman. But they can’t stop the forgotten feelings swirling between them—or ignore the sacrifices they’d both have to make for a future together. 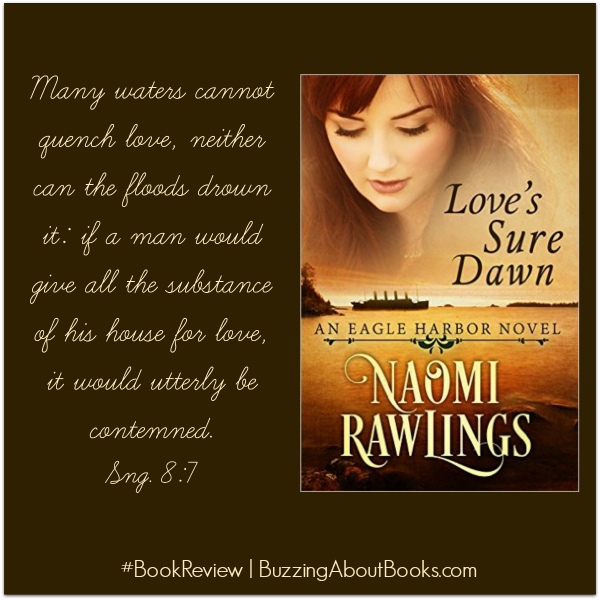 Love’s Sure Dawn is a captivating tale! The characterization is excellent, and I lost myself in the drama and romance of Gilbert and Rebekah’s story. I always marvel at the emotional and spiritual growth of Naomi Rawlings’ characters and the inspiration that is beautifully woven through her stories. This talented author has masterfully stirred my emotions throughout this compelling series, and I can’t wait to read more! 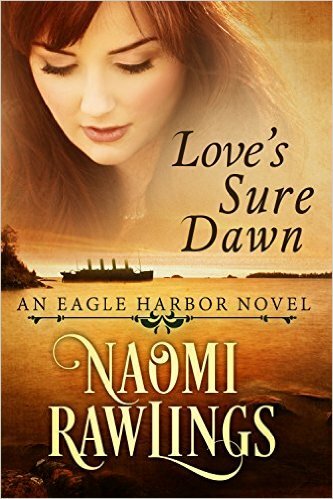 If you’re a fan of historical romance, I highly recommend Love’s Sure Dawn, as well as the other books in the Eagle Harbor series. 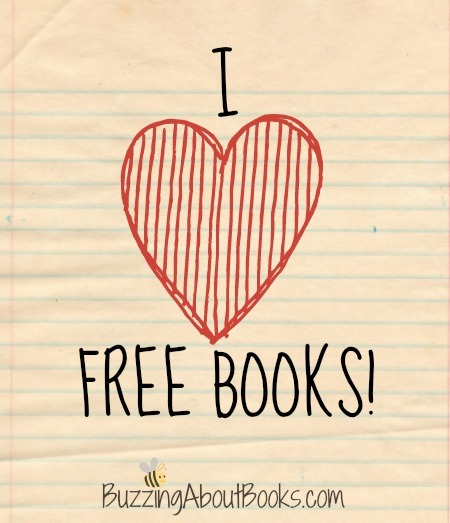 Each novel can stand alone, but I recommend reading them in order for a greater understanding of the characters and enjoyment of their stories. A mother of three, Naomi Rawlings spends her days picking up, cleaning, playing and, of course, writing. Her husband pastors a small church in Michigan’s rugged Upper Peninsula, where her family shares its ten wooded acres with black bears, wolves, coyotes, deer and bald eagles. Naomi and her family live only three miles from Lake Superior, where the scenery is beautiful and they average 200 inches of snow per winter. 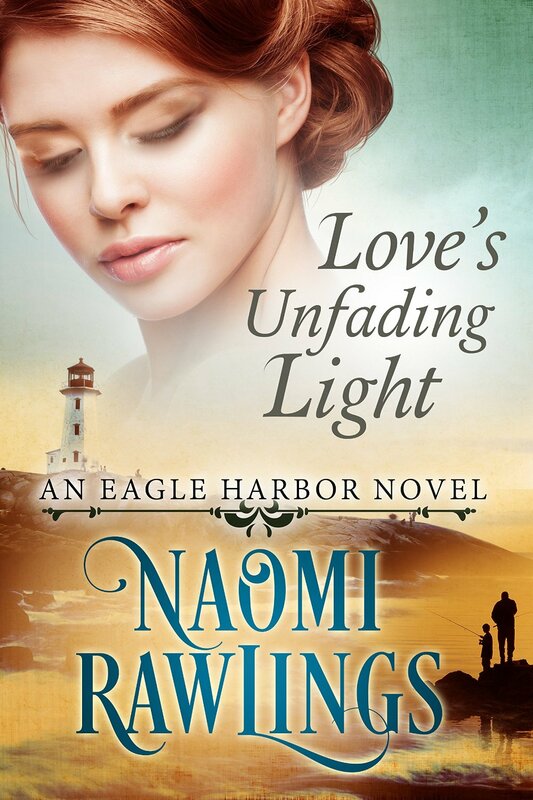 Naomi writes bold, dramatic stories containing passionate words and powerful journeys. 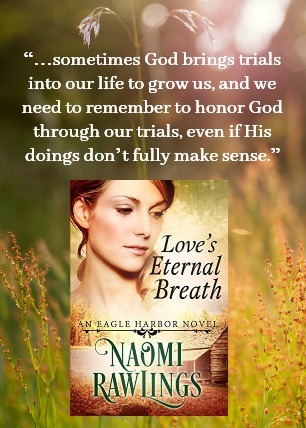 To learn more about Naomi and her books, please visit her website. Tressa Danell is finished with men–from the wastrel who left her a widow, to the smelly trapper who keeps proposing, to the banker who wants to repossess her bakery. Every hour is spent working to pay off her late husband’s debt and keep a roof over her son’s head, though it’s doubtful she can do both for very long. But one thing’s certain–she’ll never be beholden to a man again. It’s time to return to the town of Independence for another hilarious romp! Mercy, Martha and Maude are at it again! 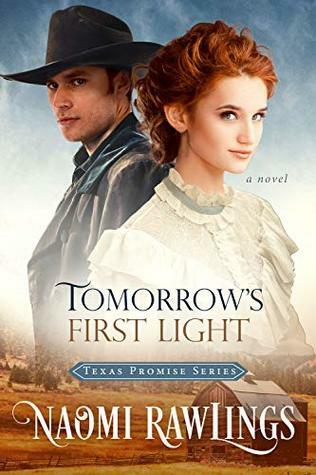 Not only has Martha Tindle sent away for a mail-order bride for her son Morgan without telling him, but her cantankerous sister Eunice is coming to town for a visit! 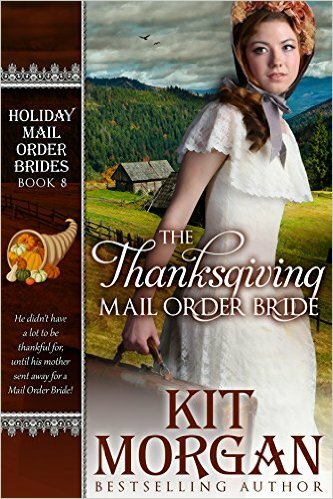 The three matchmaking meddlers are beside themselves when things don’t go as planned, and poor Martha is not only stuck with a son who doesn’t want a bride, but a sister who has other ideas of whom he should marry. Then there’s the bride herself … one Daisy Evers, a woman with a secret she hopes to keep hidden, whether she marries or not!